To Cite: Torun Parmaksiz E, Caglayan B, Kiral N, Dogan C, Salepci B, et al. An Unusual Case of Multidrug Resistant Miliary Tuberculosis, Arch Clin Infect Dis. 2016 ; 11(4):e37805. doi: 10.5812/archcid.37805. Introduction: Miliary Tuberculosis (TB) is a rare and lethal form of TB and needs urgent detection and treatment. Miliary TB due to drug-resistant strains of Mycobacterium tuberculosis is even more difficult to manage. We present clinical and bacteriologic findings of a rare case of miliary multi-drug resistant tuberculosis (MDR-TB). Case Presentation: Our case was a young female patient with in vitro fertilization (IVF) pregnancy, who had radiological diagnosis of miliary TB and had not responded to antituberculous therapy with four drugs. Second line antituberculous drugs were started empirically and definite diagnosis of MDR-TB was obtained by culture and drug susceptibility test of biopsy specimens. Conclusions: Although very rare, MDR miliary TB can be seen in immunocompetent subjects. We, thereby, emphasize that early recognition and initiation of treatment are associated with a significant improvement in outcomes. Tuberculosis remains a serious worldwide health problem associated with high morbidity and mortality. Miliary Tuberculosis (TB), a clinically rare form of TB, is a potentially lethal disease if not diagnosed and treated early. 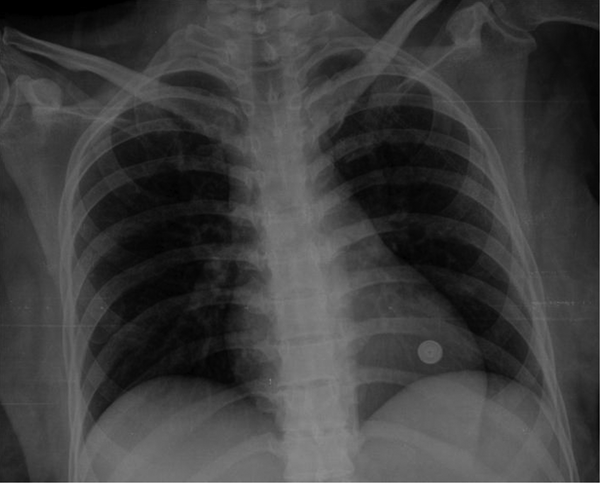 Since miliary TB can involve many organs, patients may present multisystem involvement. For instance, tuberculous meningitis is thought to occur concordantly with miliary tuberculosis in 10% - 30% of cases (1). Both miliary tuberculosis and tuberculous meningitis and encephalitis can be fatal diseases, unless appropriate treatment is applied. Despite the availability of drugs, delay in diagnosis and initiation of treatment may lead to significant morbidity and mortality. The emergence of drug-resistant strains of Mycobacterium tuberculosis has made the condition even more difficult to manage. Miliary TB caused by Multi-drug resistant tuberculosis (MDR-TB) strains is a very rare condition, especially in immunocompetent hosts. We report on a young female with no immune suppression, who was diagnosed with MDR miliary TB and meningoencephalitis. Although very rare, MDR miliary TB can be seen in immunocompetent subjects. We, thereby, emphasize that early recognition and initiation of treatment are associated with a significant improvement in outcomes. Our case was from a training hospital in Istanbul, Turkey. In December 2014, a 30-year-old female was referred to obstetrics and gynecology department of our hospital with complaints of fever and vaginal bleeding. She was known to have a 19-week in vitro fertilization (IVF) pregnancy. She had initially been treated with ceftriaxone 2x1 g intravenously at another hospital for 10 days, but no improvement was attained. After admission to the Obstetrics and Gynecology department, routine laboratory blood tests and blood and vaginal cultures were sent to the labratory, and piperacillin/tazobactam 3 × 4.5 g, intravenously, was started according to the culture results. The pregnancy was supported by hormone treatment. Fever was persistent despite antibacterial therapy. The pregnancy had to be terminated with vaginal delivery and bumm curettage. The pathology of the placenta revealed edematous chorionic villi and focal fibrin deposits. 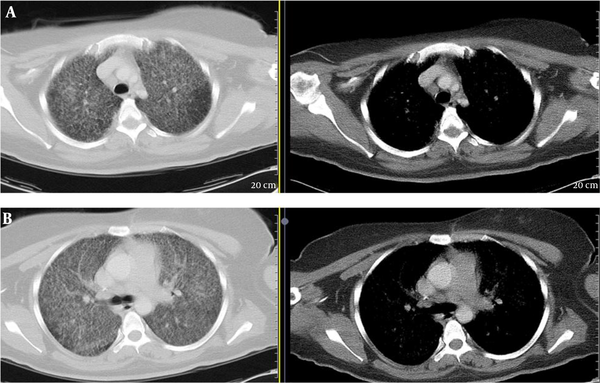 Chest radiograph and Computed Tomography (CT) scan revealed uniform-sized small nodules randomly distributed throughout both lungs and the patient was transferred to the department of chest diseases (Figure 1). She had no history of chronic disease, other than gestational diabetes. She was not a smoker and denied use of alcohol or any drugs. She had no contact with a person with TB infection. On physical examination during admission to our clinic, she appeared well. Her temperature was 38.7°C blood pressure 110/70 mmHg, pulse 100 beats per minute, respiratory rate 30 per minute and transcutaneous oxygen saturation 96% while breathing room air. Lung and heart auscultation revealed normal sounds. All other physical examination was unremarkable. Complete blood count, biochemical and serologic tests and arterial blood gas analysis were performed in the hospital laboratories by standardized and calibrated equipment and experienced staff. Laboratory results are summarized in Table 1. Evaluation of initial laboratory tests revealed anemia, slightly elevated liver function tests, high erythrocyte sedimentation rate and high C-reactive protein. Arterial blood gas analysis revealed PH of 7.42, PaO2 63.4 mmHg and PaCO2 28.9 mmHg. The human immunodeficiency virus antibody test was negative. Hepatitis markers, rubella, toxoplasma, syphilis and Cytomegalovirus (CMV) tests were negative. Consecutive blood and urine cultures remained sterile. Thoracic computerized tomography (CT) revealed bilateral, widespread, diffuse, micronodular formations throughout the lungs (Figure 2). The sputum was negative for Acid Fast Bacilli (AFB). Tuberculin skin test was 6 mm, and she had one Bacillus Calmette-Guerin (BCG) vaccine scar. Ophthalmological examination, performed for evaluating eye involvement of miliary TB was normal. Oral anti-tuberculous therapy with Isoniazid (INH) 300 mg/day, Rifampicin (RFP) 600 mg/day, Ethambutol (EMB) 1500 mg/day, and Pyrazinamide (PZA) 2000 mg/day, was started empirically. However, symptoms persisted with high fever. We performed bronchoalveolar lavage (BAL) and transbronchial lung biopsy. Pathological results were unremarkable and microbiological investigation of BAL fluid was negative for AFB. Despite regular anti-tuberculous treatment for 20 days, the symptoms became worse and fever persisted. Thoracoscopic lung biopsy was performed and the result revealed necrotizing granulomatous inflammation. The lung tissue smears remained negative for AFB. Steroid therapy with combination of anti-Tb treatment was started, however no improvement was attained. The fever had consisted, the general status of the patient kept getting fulminantly worse, and deteriorated even more with mental disorientation. Brain and thoracic and lumbar magnetic resonance imaging suggested TB meningoencephalitis. Lumbar puncture (LP) showed clear cerebrospinal fluid (CSF), and CSF test revealed glucose level of 5 mmol/L and protein level of 6.8 g/L; 800 cells/mm3 were counted with 70% pre-neoplastic lesion (PNL). Gram stains and CSF culture were negative. The CSF smears were negative for AFB. 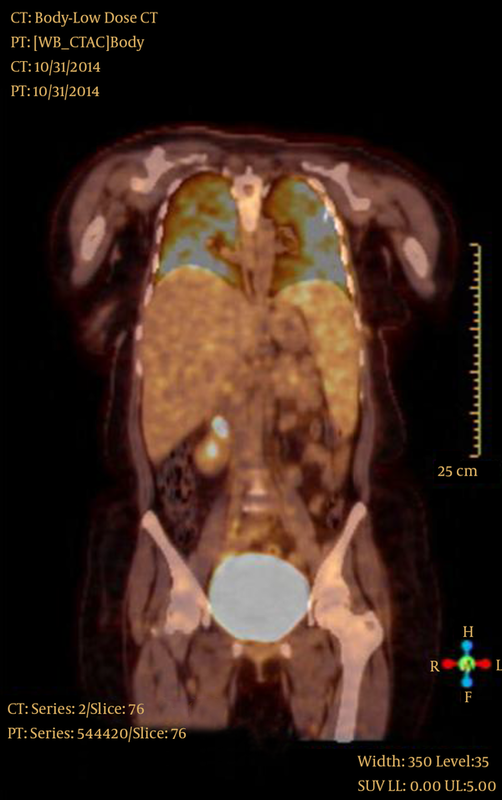 F18-Fludeoxyglucose-positron emission tomography (F18-FDG-PET)/CT examination was conducted to find an undetected malignancy, and PET-CT scans revealed FDG attenuation in pulmonary (standardized uptake value-SUV-6.6), hepatic (SUV 5), splenic (SUV 4.4) and meningeal (SUV 7.8) tissues. No indication of malignancy could be detected (Figure 3). All repeated blood cultures were negative. All consecutive sputum AFB smears and TB cultures were negative. Keeping in mind the fact that we had histopathological diagnosis consistent with tuberculosis, yet a disease fulminantly progressing despite appropriate and regular first-line anti-tuberculous drugs, the disease was considered as MDR-TB and second line drugs were started, empirically; namely para-aminosalicylic acid 12 g, cycloserine 1000 mg, prothionamide 1000 mg, moxifloxacin 400 mg, amikacin 1 g and pyrazinamide 2000 mg daily. On the first month of the second line treatment, we obtained the Drug Susceptibility Test (DST) results of the lung tissue, which demonstrated multi-drug resistant pulmonary TB with resistance to isoniazid, rifampicin, ethambutol and streptomycin. Both clinical condition of the patient and radiological findings progressively improved. Her mental disorientation recovered. She is currently being followed up with direct observation of the treatment and is in good general condition. 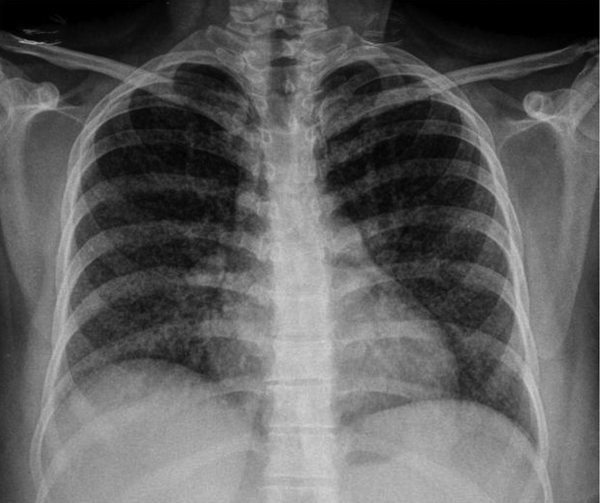 The follow-up chest radiograph showed near total resolution compared to the initial presentation (Figure 4). Multi-drug resistant tuberculosis is a serious global threat and the extent of the problem is generally underestimated due to inadequate strategies to detect patients accurately and in a time efficient manner (2) Diagnosis and management of MDR-TB poses some challenges. Diagnosis of MDR tuberculosis is not always easy through conventional methods, due to the long time required for cultures and thereby antibiograms. Despite strong suspicion, MDR TB remains a difficult diagnosis when culture is negative. In our case, several factors together played a role in starting empirical second-line anti-tuberculous drugs: 1- definitive diagnosis of TB with histopathological confirmation, 2- absence of documentation of any other infectious, hematological or malignant disease, 3-deterioration of the general condition of the patient, 4-onging fever despite first line TB treatment, as well as corticosteroids, 5- development of meningoencephalitis under TB therapy. We had a definitive diagnosis of TB with histopathological confirmation, but no yield of M. tuberculosis from sputum, BAL or CSF by AFB stain or culture. The challenging fact is the absence of clinical or radiological response to anti-tuberculous treatment. Both MDR-TB meningitis and MDR miliary TB are limited to case reports. In our case, the most probable scenario was that, during the initial pulmonary infection, M. tuberculosis entered the systemic circulation and reached the CNS. Hematogenous dissemination of the bacteria seemed to have affected CNS, liver and spleen in addition to both lungs. Multi-drug resistant miliary TB accompanied by tuberculous meningitis is a difficult-to-treat infection with a high fatality rate. Despite the fact that tuberculous meningitis is usually seen during young childhood, adults may also present the disease (3). Clinical suspicion, awareness of the disease, early diagnosis and timely anti-tuberculosis treatment can be life-saving. Timely initiation of therapy in cases of disseminated TB is associated with a significant improvement in outcomes. There have been several previous reports on miliary TB caused by MDR M. tuberculosis (4), most of which are found in immunocompromised hosts. Multi-drug resistant miliary TB in immunocompetent patients has been documented in only a few reports (5, 6). Our patient was one of the few immunocompetent cases with disseminated miliary MDR TB. There are contradictory reports on the tendency of increased TB disease in pregnancy. Some authors claim that pregnant women are at increased risk of TB (7), whereas others are against the concept of gestational immune suppression. They propose that the immune system is one of the most important systems protecting the mother against the environment and preventing damage to the fetus (8). Another important point about pregnancy and TB is that, TB in pregnancy poses a diagnostic challenge, firstly because of the non-specific nature of early symptoms, which simulate physiological effects of pregnancy, and secondly because both patients and physicians are not very willing for radiographic investigations in order to prevent harm to the fetus. Nevertheless, it must be kept in mind that an undiagnosed TB infection is life-threatening for the mother, as well as the offspring. The long period needed for microbiological confirmation of TB on basis of culture of the pathogen may lead to delay in administration of effective treatment. This indicates the need for usage of more rapid alternative tests for early detection of MDR-TB. In addition, as suggested in a previous report, drug-susceptibility tests for first line drugs should be carried out in case of TB, in the beginning of treatment (9). In conclusion, it is crucial to consider drug resistance in the differential diagnosis of patients with miliary pattern and disseminated TB and deterioration despite anti-TB treatment, even if the patient has no immune suppression. Prompt diagnosis and initiation of appropriate therapy is life saving. Authors’ Contribution: Study concept and design: Elif Torun Parmaksiz; acquisition of data: Nesrin Kiral, Coskun Dogan and Sevda Comert; drafting of the manuscript: Elif Torun Parmaksiz and Benan Caglayan.